The kitchen and bath trade loves great design; it’s no secret that great projects are a driving force in this industry. Indeed, creativity and artistry are frequently recognized and rewarded through a plethora of design competitions, with glossy project photos splashed across the pages of magazines, websites, blogs and even on TV. But in the celebration of design, the very professionals who create those projects and elevate the industry are sometimes overlooked. Yet great design doesn’t exist in a vacuum; the kitchen and bath industry continues to prosper largely due to the efforts of innovators who aren’t afraid to lead the way and chart their own course, whether through design, education, technology, showroom development, community service, new business models or specialty areas that evolve alongside today’s ever-changing consumers. For this reason, Kitchen & Bath Design News is pleased to announce its inaugural KBDN 50 list of Innovators, honoring some of the industry’s finest dealers, designers and industry leaders who are out there on the front lines, right now, redefining the kitchen and bath trade. Nominated by their peers and then carefully reviewed by the KBDN nominating committee, the 2017 Innovators reflect a true cross section of the industry. Some are in the early stages of their careers; others have devoted decades to the industry. Some have showrooms; others are independent designers. Some specialize in an essential niche – such as Universal Design, theme design, decorative plumbing and hardware, the luxury market, sustainable design, appliance showroom design or virtual reality technology – and, in many cases, they have literally and single-handedly redefined that niche, changing how spaces are conceived, designed and experienced. Of course some have created entirely new niches, such as the online design portfolio better known as Houzz, and the Network Management System business management software program created specifically for kitchen and bath dealers. From seasoned design professionals who devote hundreds of hours to mentoring the next generation of design talent to authors who educate the public about key topics like safety and sustainability, many of the designers on the list have made sharing their knowledge a priority. They give seminars and host webinars, speak at conferences and teach college courses, and share their knowledge through websites, blogs, radio shows, HGTV appearances and advice columns. A number of these innovators are also active in various professional organizations, serving the industry through their work with local and national chapters of their associations, buying groups and other industry groups. These design professionals are integral to creating educational programs for the industry and funding scholarships for design students; they foster networking opportunities and develop unique ways to engage with their communities, both within the trade and with consumers. They lead by coloring outside of the lines, and in doing so, create new pathways for other design professionals to follow. Of course design innovation is also an important part of the package, with many of the top 50 having received myriad awards and design accolades for creating fashionable and functional spaces that wow all who see them. By incorporating their unique vision into their kitchen, bath and showroom projects, they not only dramatically improve the lives of their clients, they also raise the bar for all of the industry. And ultimately, that’s what innovation is all about. 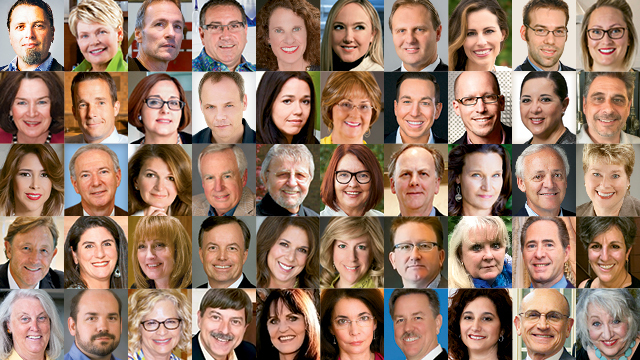 Below KBDN spotlights “The Innovators” – 50 extraordinary kitchen and bath professionals who are changing the industry right now. KBDN will begin accepting nominations for next year’s Innovators on Jan. 1, 2018. Visit our website for further details.